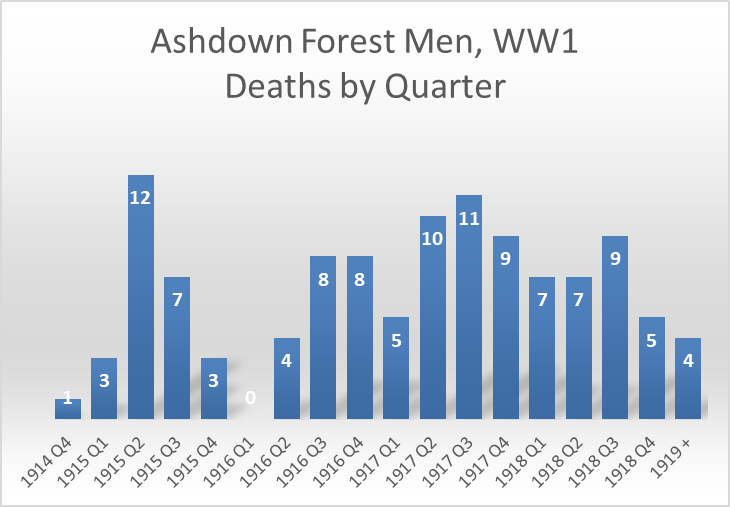 To mark the centenary of the First World War the Ashdown Forest Research Group has written case studies on all the men who died while on military service during the war and who are commemorated by the war memorials at Forest Row and Hartfield in Sussex. 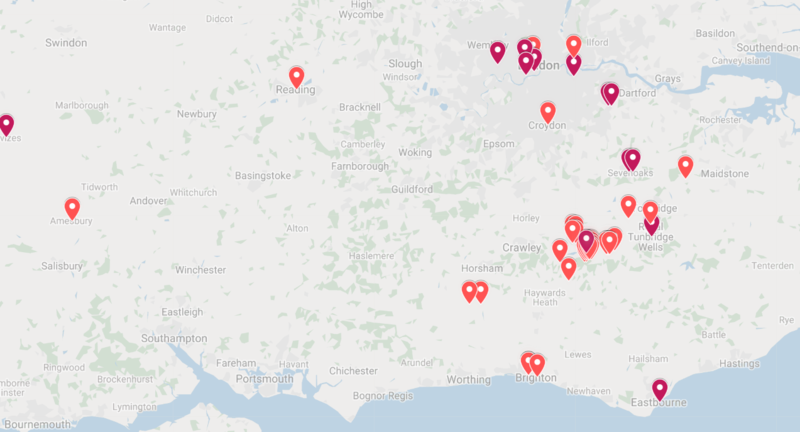 These are parishes which lie on the northern fringes of Ashdown Forest that traditionally have had strong links to the Forest. The project began in late 2013 with the aim of completing all the case studies — 113 in total — by Armistice Day, Sunday 11 November 2018, the centenary of the end of the First World War. To produce the case studies the Group researched the men's backgrounds, the lives they led before they went off to war, the details of their military service, the circumstances in which they died, their family and local connections, and the reasons why their names were recorded on the war memorials. The research has relied heavily upon sources of information available through the internet supplemented in some cases by information provided directly by relatives and others. Each study as it was completed was added to a compilation document which was made available for viewing or downloading from the Group's page on the website of the Conservators of Ashdown Forest. The Group later created a website dedicated to the project where each study can be viewed directly online. This has now become the usual way in which the studies are accessed by members of the public. The starting point for the group was the war memorials at Forest Row, Hartfield and Coleman's Hatch. After the end of the First World War memorials to the fallen were erected up and down the country, funded by local subscription. Their openings reached a peak in 1920, which was the year the Forest Row and Hartfield memorials were unveiled. Situated on Lewes Road in the centre of the village, Forest Row war memorial was funded by public subscription. It was designed by the sculptor Ernest G. Gillick RA, whose other works included the Cenotaph in George Square, Glasgow. It takes the form of a sandstone tapering pillar about 18 feet in height with an inscription that reads: "In remembrance of the men of Forest Row who died for England in the Great Wars". The names of those who fell in the 1914-18 and 1939-45 wars are inscribed on the four sides of the pillar and on its plinth. Forest Row war memorial was unveiled in 1920 by General the Honourable Sir Herbert Alexander Lawrence and his wife Isabella (granddaughter of the Earl of Harewood). The son of a Viceroy of India and a career soldier, Sir Herbert had risen to become General Haig's Chief of General Staff, British Armies France, 1918-19. He had lived at Ashdown Place, Forest Row, but by the time of the unveiling had moved to London. Both of his sons, Oliver Lawrence and Michael Lawrence, died in the Great War and are commemorated on the memorial. 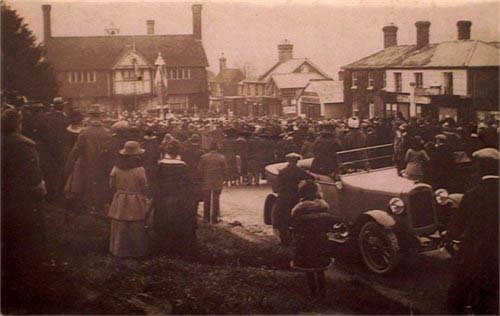 Hartfield war memorial, which stands on the High Street, was also unveiled in 1920. It is inscribed: "To the Glorious Dead of Hartfield". 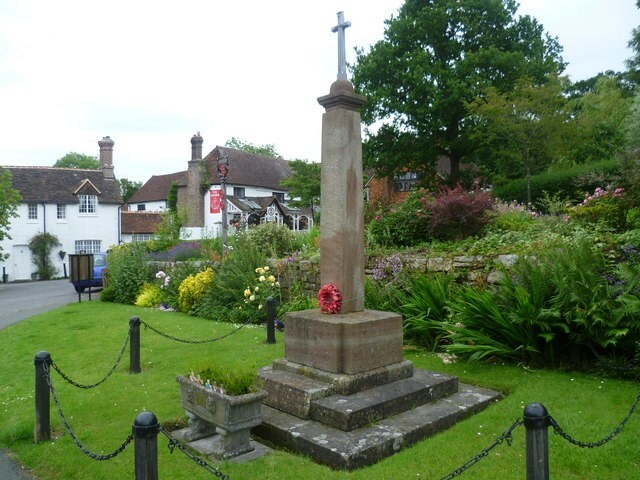 According to Historic England (both Forest Row and Hartfield war memorials are listed structures) it was erected to commemorate 40 local servicemen who died during the First World War. Built by Burslem Stonemasons of Tunbridge Wells, the memorial was unveiled on 10 October 1920 by John McAndrew and dedicated by the Rector of Hartfield. The names of the fallen from the Second World War were added at a later date. In 2013 a project was undertaken to improve the legibility of the inscriptions. In 2014 a further 15 names were added, comprising 11 First World War names and four Second World War names (including three civilians killed in an air-raid on East Grinstead in July 1943). The memorial plaque inside Holy Trinity Church, Coleman's Hatch, built in 1913, was produced by R. Thompson of Kilburn. All those men named on it who fell in the First World War are also commemorated on Hartfield war memorial. However, in addition, within the church there is a small plaque, installed in 1928, dedicated to Lt. George Baylay, who died in the War and who is not named on the war memorials. Lt. Baylay was added to the list of case studies. The names of some of the men commemorated on these war memorials also appear on other memorials elsewhere both in this country (e.g. school, college or university rolls of honour, regimental rolls of honour, etc.) and overseas (e.g. battlefield memorials). The case studies identify these memorials where information about them is available. Associated with the war memorials are books of remembrance. The Group has referred in particular to the one kept at Holy Trinity Church, Forest Row. This contains information about the men on Forest Row war memorial that was supplied after the war by, usually, close relatives such as spouses and parents. The first task of the Group was to create a list of men named on the war memorials at Forest Row and Hartfield who had fallen in the First World War. 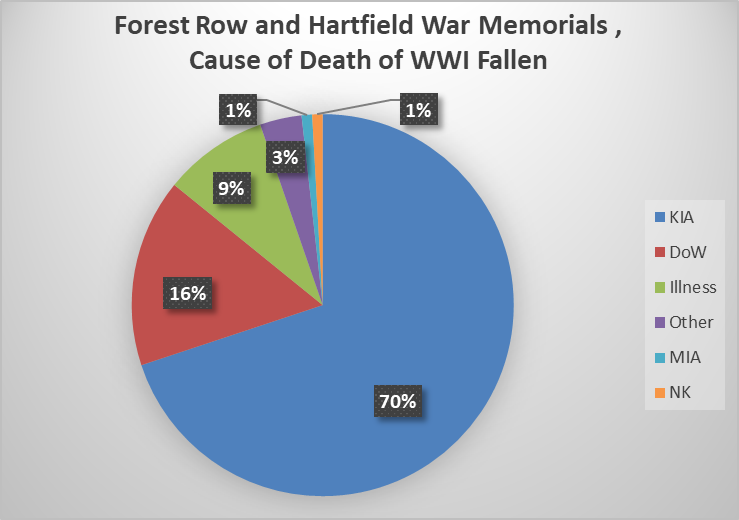 The war memorial in Forest Row names 65 men who fell in the First World War, while the war memorial in Hartfield names 51. Two men appear on both memorials. As already noted above, a further man is commemorated by a plaque installed within Holy Trinity Church, Coleman's Hatch. This brings to 115 the total number of men who fell in WW1 who became the subject of the Group's research and about whom case studies were to be written. Click here for a list of these men by war memorial. In actuality the Group will only be able to write 113 case studies. Nothing is known about two men, Pte. Frederick G Story and L/Cpl G A West, beyond their names and ranks. Indeed, it is not even certain that they were casualties of the First World War. Finally, it should be noted that one man named on Hartfield war memorial who has been included in the case studies, Charlie Wheatley, died in a drowning accident at Portsmouth in 1921, well after the war had ended. In carrying out its research, the Group has relied extensively information available online, much of which has become available quite recently. When researching the men's lives before the war, a key source were the listings of the decennial census, which are available online up to the 1911 census. The census enumerations make it possible to identify the men and the members of their families, their ages and occupations, and their changes of location from decade to decade. As far as war service was concerned, extensive use was made of a wide variety of official war records that are available online, including the website of the Commonwealth War Graves Commission (CWGC), which also provides very useful information about cemeteries and memorials, and specific information about the men such as their grave registration report forms. For information about the men before, during and after the war online press reports available through the British Newspaper Archive were valuable. Many other sources were also drawn on such as school and college archives. The case studies acknowledge particular sources wherever possible. The online case study website includes a Sources and Acknowledgements page for the project. In writing the case studies members of the Group have received helpful information from relatives of the men who are commemorated, for which we are most grateful. We would welcome any further information, and also photographs, which would help us to improve the case studies. We would also welcome any corrections to the errors that will inevitably have crept into our work. The research we have done has highlighted many aspects of the Great War — and of the war memorials themselves — that were not obvious to us when we began our project. It has also revealed something about the environment which the men came from, their different social backgrounds and ways of life before the war. Here are some key points that have emerged from the project. When the Group began its work it expected that the men commemorated on the war memorials would mainly be locals with close connections to Ashdown. 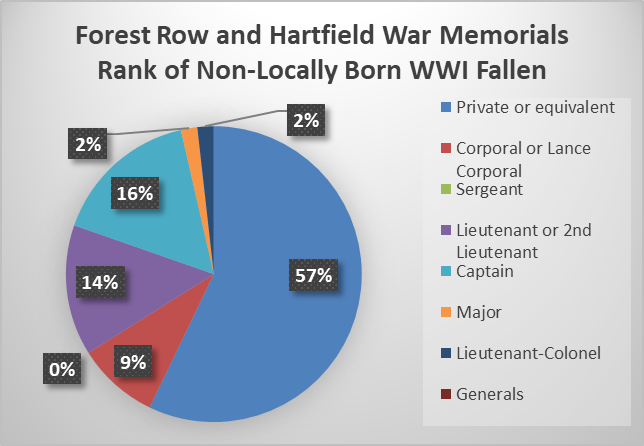 If we consider place of birth as being a key consideration in being regarded as 'local', only about half (49%) of the men on the two war memorials were actually born in Forest Row or Hartfield (see chart above). If we cast the geographical net wider to the county level, 68% were born in Sussex. This still leaves a significant fraction who were born outside the county. As an aside, it is noteworthy that a significant fraction of the men — 15% — had been born in Kent. 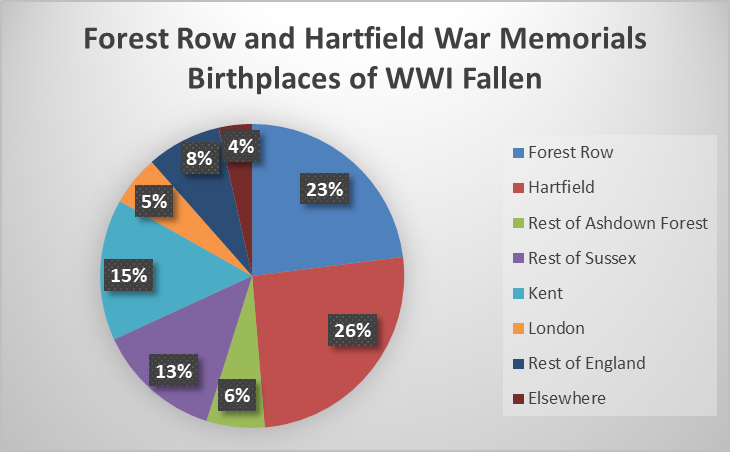 This is not surprising given how close the county is to Forest Row and Hartfield: a significant number of the men were born in Kent parishes that lay only a few miles away from Forest Row and Hartfield. There are of course examples of men commemorated on the war memorials whose families had been long resident in the area. Private Walter Martin, who died in the Battle of the Somme aged 18, is the youngest man commemorated on Forest Row's war memorial. The son of a brewer's drayman, he was born in the centre of the village. 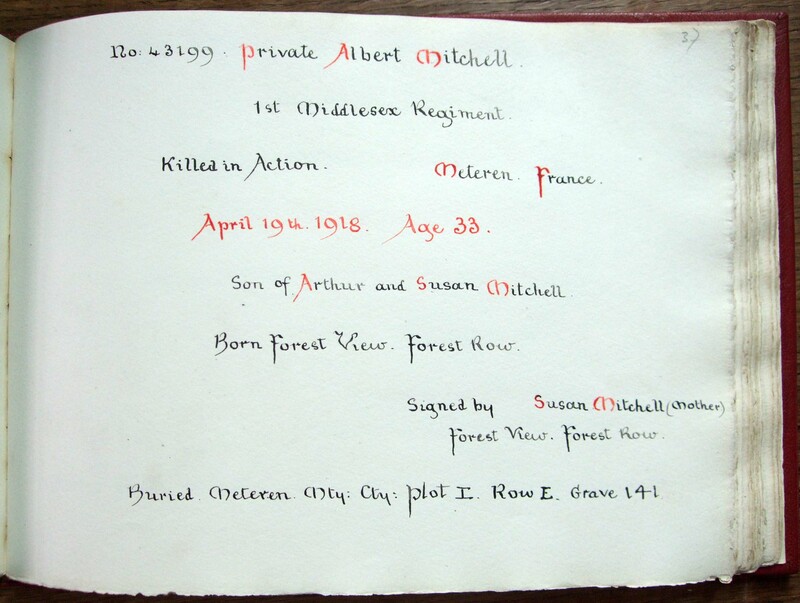 It was his mother who supplied his details for the village's book of remembrance. Two families with widespread and long-standing connections to the area who tragically are represented several times on the two war memorials, the Maskells and the Wheatleys and Weedings, have been researched in detail by the Group and are described elsewhere in this document. 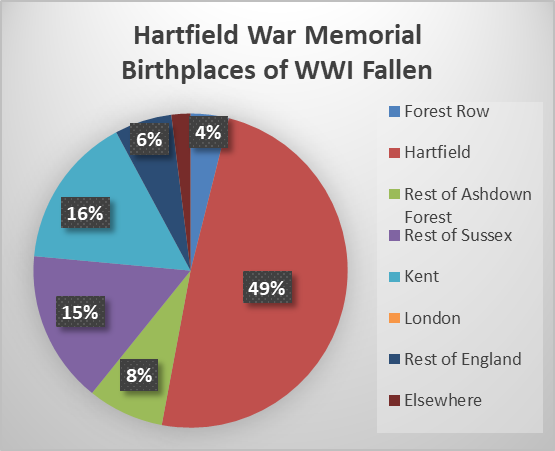 The birthplaces of the men commemorated on the two war memorials suggest that those Hartfield war memorial tended to be more closely tied to the local parish by birth than those on Forest Row memorial. Two-fifths (39%) of the men commemorated on Forest Row war memorial had been born in Forest Row parish, whereas a considerably greater proportion — almost half (49%) — of those commemorated on the Hartfield memorial had been born in Hartfield parish. 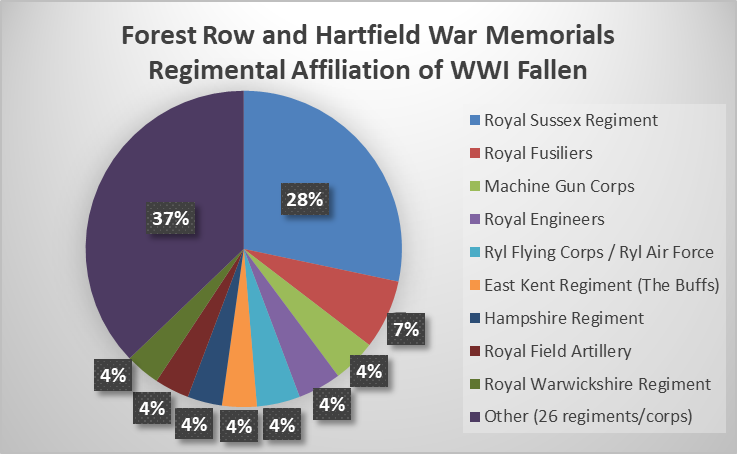 The contrast grows if we look beyond the local parishes to consider what proportion of the men commemorated on either memorial were born in the county: 61% of those named on Forest Row memorial were Sussex born, compared with 76% of those named on Hartfield memorial. 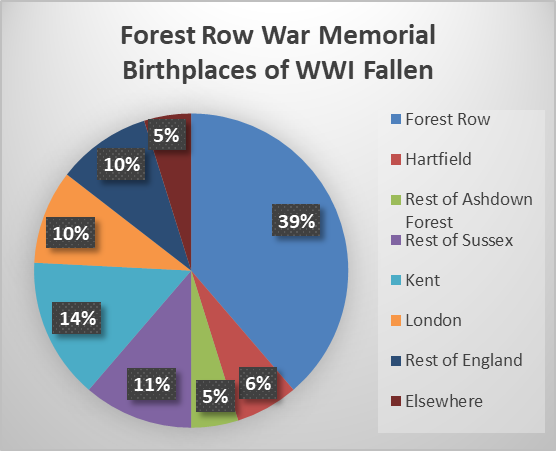 A lot more of the men commemorated on Forest Row war memorial were born outside Sussex or Kent — about a quarter (24%) for Forest Row, a mere 8% for Hartfield. These contrasts reflect differences in the populations of the two parishes and their relative openness. Forest Row developed a more diverse population in the latter half of the 19th century as improved communications and recreational attractions such as Royal Ashdown golf club (opened 1888) brought in people — especially the well-to-do and newly retired — from outside the area to settle. Hartfield by contrast remained rather insular. In this connection it is perhaps significant that six men named on the Forest Row memorial had been born in London, compared with none for Hartfield. Four of the six were officers whose well-to-do parents had moved to Forest Row to live in large country houses. compared with those who were not locally born (right). 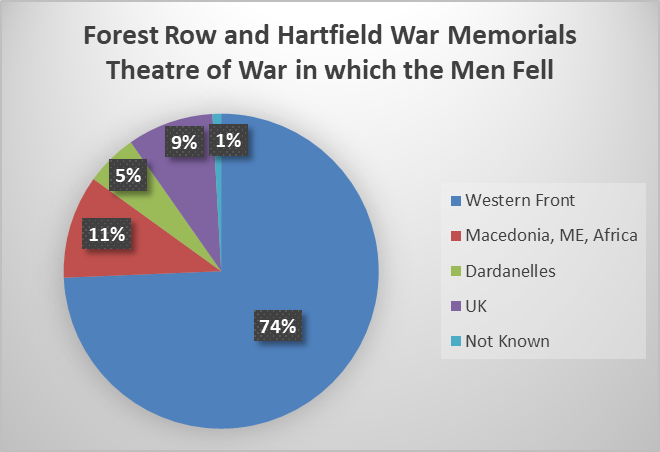 The above pie charts look at the men commemorated on Forest Row and Hartfield war memorials together with regard to the military ranks they held at the time of death. Locally-born men (left-hand chart) were much less likely to be officers than those who were not born locally (right-hand chart). 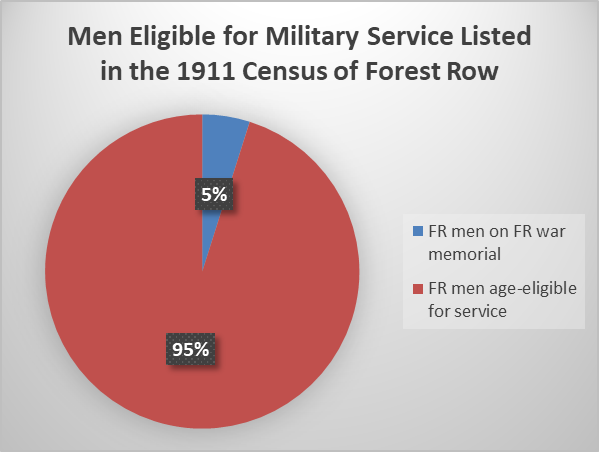 Men who had been born locally — in the parishes of Forest Row and Hartfield — largely served in the lowest three ranks (left-hand chart) — 93%. Only four of the 57 men who had been born locally were officers: Frederick Polehampton, William Melville, Eric Waters, and Cyril Robinson, and they were all lieutenants, rather than captains or other higher ranked officers. On the other hand, a large proportion of those who had not been born locally — 34% — were officers (see right-hand chart): 19 out of 56 men. Only 57% were serving as privates or equivalent. The officers concerned occupied all the army ranks below general: second lieutenant, lieutenant, captain, major and lieutenant colonel. It may be of interest to add that of the 23 men commemorated on the war memorials who were officers (20% of the total), the majority (60%) had attended public schools. Seven had been pupils at Eton alone, and another seven had been at other well-known schools such as Harrow, Rugby, and Haileybury. A number of men commemorated on both war memorials only had rather tenuous connections to Forest Row or Hartfield, particularly, it seems, those who were officers. A handful had probably never visited the area. The reason they were named on the war memorial might have been that their parents had moved to the district, perhaps after retirement or after acquiring a second home here, and it was they who ensured that the names of their son (or sons) were represented on the local memorials that were erected after the war. For example, Captain Wilfred Brownlow probably never saw Forest Row but he is commemorated on the war memorial because his parents settled there after his father retired from the Army. The following three maps illustrate the differences that exist between the two war memorials in respect of the geographical spread of the birthplaces of the men they commemorate. 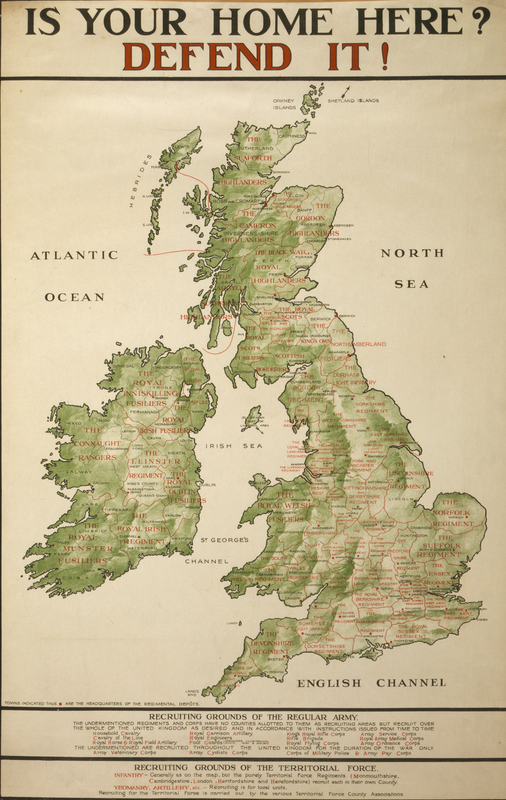 The maps focus on just those birthplaces that lie in southern England. A small number of men were born further afield than this (you can use the interactive Google map below, from which these 'stills' are captured, to see all the places of birth). Map (i) above shows the birthplaces of the men on both war memorials, red markers for men on the Forest Row memorial, green markers for men on the Hartfield memorial. The deeper shades of red and green indicate men who were ranked as officers. The following two maps breaks these down between Forest Row and Hartfield. Map (ii) above shows just the birthplaces of men on Forest Row memorial, while Map (iii) below shows just the birthplaces of men on Hartfield memorial. The Hartfield map seems to show a much more localised distribution of birthplaces than for Forest Row, with birthplaces concentrated in east Sussex and west Kent. 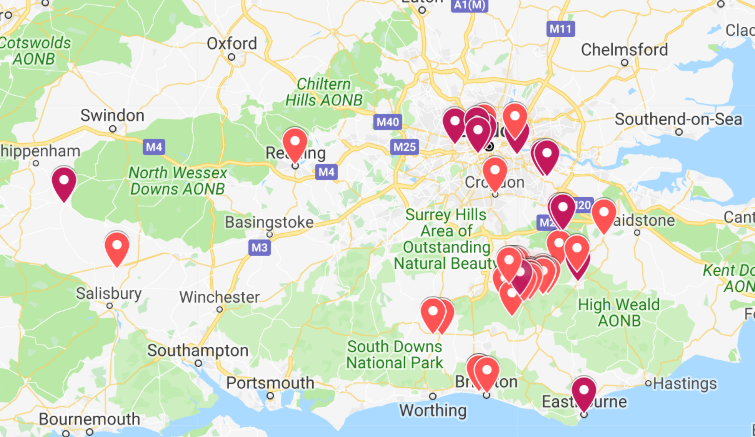 The places of birth of the men commemorated on Forest Row's war memorial seem to be more dispersed, and include the London area and south coast. Furthermore, the officers shown on the Forest Row map seem more likely to have been born away from the parish. 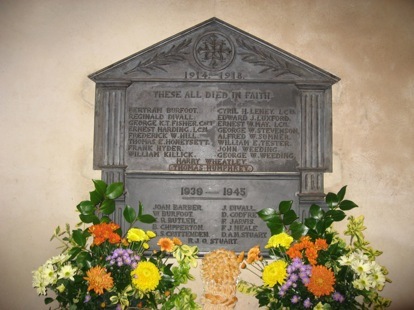 There are only two officers commemorated on Hartfield's war memorial and they were born in the parish. As noted above ("Forest Row men were less likely to be locally born than Hartfield men", these differences seem to reflect differences in the populations of the two parishes, with Hartfield being more insular than Forest Row. Note that there is a strong clustering of birthplaces in the local parishes which these maps as presented tend to hide. To see these, use the interactive map below to zoom in on these clusters. Click on the image above to view and explore an interactive Google map which shows the birthplaces of the men on the two war memorials. As in the preceding maps, the red (ranks) and dark red/purple (officers) markers refer to men commemorated on the Forest Row war memorial, the light green (ranks) and dark green (officers) markers refer to the men commemorated on Hartfield war memorial. The minimum age for military service was 18, 19 if serving overseas, while the maximum age was 38. The men in our cohort however were not generally particularly young, as the above graph illustrates. The average age was 27 and more than a third of the men (39%) were aged 30 and over. Indeed, seven were in their forties. Only twelve of the 113 were under 20. The two youngest men on the war memorials were Privates Philip Thomsett and Walter Martin, who were aged 18 when they died in the Battle of the Somme in 1916. Walter Martin's body was never recovered, and he is commemorated on the Thiepval Memorial. Philip Thomsett was gravely wounded and repatriated to England, where he died in the First London General Hospital, Camberwell. He is buried in Forest Row cemetery. The oldest man on the war memorials is also one of the most unusual. Edmund Fisher was born in Kensington in 1872, the sixth of eleven children. He came from an elite family. His siblings included H.A.L. Fisher, historian and Minister of Education; Admiral Sir William Wordsworth Fisher; Florence Henrietta, playwright and wife of Sir Francis Darwin (son of Charles Darwin); and Adeline Vaughan Williams, wife of the composer Ralph Vaughan Williams. Educated at Haileybury public school, he became an architect. At the outbreak of war he was too old for active service but, after training with the Royal Field Artillery, he was accepted for active service from June 1917 and fought on the Western Front as a 2nd Lieutenant. Unfortunately, he was struck down with appendicitis in January 1918 and died of peritonitis in March. He is commemorated on Forest Row war memorial because he was married to Janie Freshfield, daughter of Douglas Freshfield, a lawyer and celebrated mountaineer, of Wych Cross Place in Ashdown Forest. The majority of the men were killed in action (80) or died of wounds (18). The next most important cause of death was illness (10); these included bronchio-pneumonia (3), malarial fever (2), and heart failure, shell shock, appendicitis, encephalitis and influenza (1 each). It is striking that, despite the devastating epidemic of Spanish Flu that broke out in 1918, only one man in the entire cohort, Private Ernest Cannon, succumbed to influenza, in 1918, just a week before the Armistice. Four deaths fall into the "other" category. Two men, Keith Lucas and Nigel Whitfield, both captains in the Royal Flying Corps, died in England in air accidents. Another man, Lt Col William Sykes, the highest ranked officer in the whole cohort, shot himself at his barracks at Tidworth, Wiltshire. His suicide was attributed to "overwork". A fourth casualty named on the war memorial, ordinary seaman Charlie Wheatley, died in 1921 in a drowning accident that had no connection with the war. The number of fatalities fluctuated markedly as the war progressed. In the first part of the war there was a distinct peak in mid-1915, followed by a marked lull in the first months of 1916. The third quarter saw a sharp rise. The Somme offensive began on 1 July 1916 and many of the men in our cohort lost their lives in these and ensuing battles on the Western Front. But casualties climbed still further in the second halves of 1917 and 1918. The casualties however did not end with the Armistice. Five men died after the Armistice from illnesses that they contracted during the war. A few key battles on the Western Front accounted for the deaths of a large number of men in our cohort. The Battle of Loos (25 September-15 October 1915) accounted for four, the Battle of the Somme (1 July to 18 November 1916) twelve, the Battle of Arras (9 April-16 June 1917) and the Third Battle of Ypres (31 July-10 November 1917) seven each. In these four battles 29 men died — a quarter of the 113 casualties honoured on the two war memorials. It is also striking, considering this is a fairly small cohort of 113 men, that there were ten occasions when two or more men fell on the same day in the same battle. For example, four men died on Sunday, 9 May 1915 on the Western Front. They were fighting in the same small area of Flanders around Richebourg l'Avoué in the Pas de Calais region of northern France. Privates Frederick Edwards, Thomas Honeysett and Doctor Wheatley were serving with the 2nd Battalion of the Royal Sussex Regiment while Lieutenant William Melville was attached to the King's Royal Rifle Corps. Their bodies were never recovered. They are all commemorated on the Le Touret war memorial as well as on the war memorial in Hartfield. Two years later three men — Private Albert Gladman, Trooper George Weeding and Lance Corporal George Wheatley — were killed in action on the same day, 3 May 1917, on the Western Front in the Battle of Arras. Private Gladman of the Royal Fusiliers was buried in Faubourg d'Amiens cemetery, Trooper Weeding of the Household Battalion was buried in Roeux British Cemetery, but the remains of Lance Corporal Wheatley (a distant relative of Trooper Weeding), of the Royal West Kent Regiment, were not recovered; he is commemorated on the Arras Memorial. Later that year, much further away in Palestine, where the British forces were defending Gaza from the forces of the Ottoman Empire, three men — Captain Hanbury Kekewich, Private George Baker and Ernest Harding — all died on 6 November 1917 during the Third Battle of Gaza and all were buried in Beersheba war cemetery, alongside Hanbury Kekewich's younger brother, George, who had died of wounds nine days earlier. Captain Kekewich and Private Harding were both serving with the 16th Battalion (Sussex Yeomanry) of the Royal Sussex Regiment, while Private Baker was fighting with The Buffs (East Kent Yeomanry). The ten occasions when two or more men died in the same battle in the same location accounted for 24 men from the cohort. In addition, there were five occasions when two or men died on the same day in different locations, accounting for another 10. Together they represent 29% of the cohort . "The great blot on everything is the thud and throb of the guns night and day in France." Many Ashdown men fought and fell on the northern part of the Western Front that lay in north-east France and west Flanders. 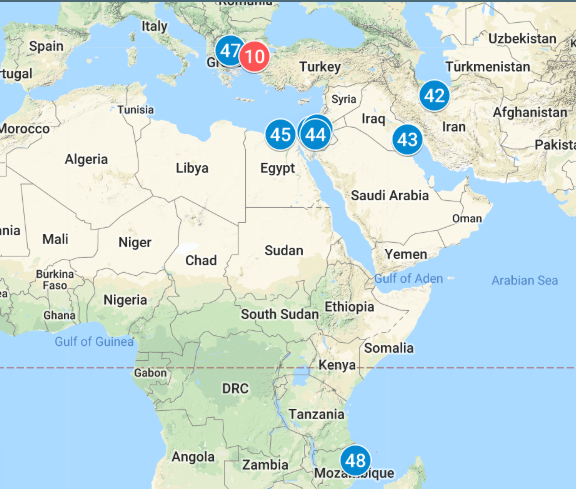 The map below shows the cemeteries (blue discs) where they are buried and the memorials (red discs) where those with no known grave are commemorated. A detailed summary of all the cemeteries and memorials plotted on the Google map above and the men who are buried or commemorated may be viewed by clicking here. On the Western Front 53 men are buried in 44 cemeteries, and another 29 are commemorated at 9 battlefield memorials, most notably Thiepval in the Somme region (6 men) and Loos (5 men) and Le Touret (4 men) in the Pas de Calais. 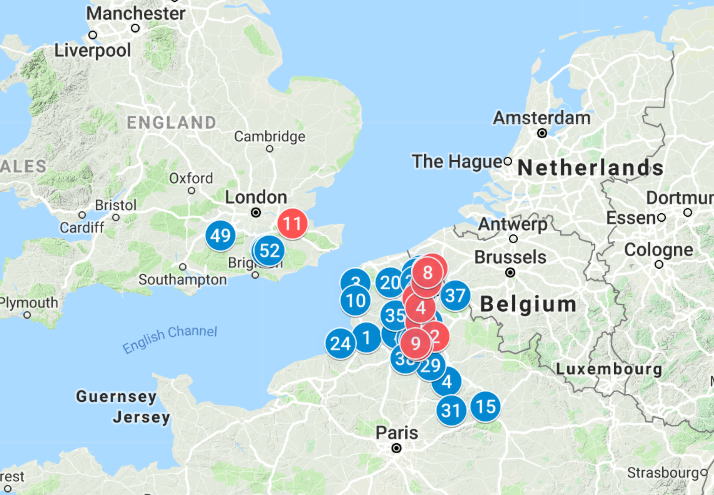 The cemeteries and memorials associated with the Western Front battles in which the men fought, such as Béthune, Festubert, Arras and Ypres, are clustered in northern France and western Belgium. Many of the battlefields lie only about 115-130 miles away from Forest Row and Hartfield as the crow flies. Some are little more than 60 miles from the Channel ports of Calais and Boulogne. A number of the overseas cemeteries in which the Ashdown men are buried are even closer. Some of the men who were wounded were taken to hospitals on the French coast, and those who died in them were buried in neighbouring military cemeteries. One of the most important military hospitals was at Étaples, near Le Touquet. Three of our men were taken there and are now buried in the adjacent Étaples military cemetery. Another man died in a hospital at Boulogne where, on a clear day, the coastline of Sussex and Kent would have been visible on the horizon. When we think of the men who fell in the Great War we naturally think of the Western Front in what is now France and Belgium. Indeed 84 men died there — almost three-quarters of our cohort (74%) — see chart above. But 18 men, about one-sixth of the total (16%), died while serving much further afield. The map below shows the cemeteries where they were buried (blue discs) and the memorials where they are commemorated (red discs). Six men fell during the disastrous Gallipoli/Dardnanelles campaign of 1915 in Ottoman Turkey. They were Benjamin Mellor, Arthur Kennard, James Simmons, Alfred Sands, John Shelley and Ernest Vaughan. None of them have known graves (three of them were lost at sea). They are all commemorated on the Cape Helles memorial, the great stone obelisk on the tip of the Gallipoli peninsula that is so visible today to ships passing through the Dardanelles strait. Two men died in Salonika: one, Albert Richardson, was killed in action on the Salonika front, the other, Frederick Southey, a driver in the Royal Army Service Corps, died in hospital from illness, possibly malaria. In 1917 six men died in Gaza, Palestine, including three (George Baker, Ernest Harding and Hanbury Kekewich) on the same day, 6 November 1917, in the Third Battle of Gaza, while, the following year, in Egypt, Gerald Horlick, a scion of the malted drink family, was to die of malaria contracted while on active service. Two men, Albert Upton and Jack Sippetts, died in Mesopotamia (in present-day Iraq and Iran) between Basra and Baghdad, where the British were seeking to defend strategic oil wells. Finally, Harold Grayer died in east Africa, in what is now Mozambique, where the British were fighting with their allies on the "Forgotten Front" to drive the Germans out of their colony of German East Africa. His cemetery is located in Pemba, today a tourist resort overlooking the Indian ocean. How strange and alien the men of Ashdown must have found it serving in these faraway places. As the pie chart in the preceding section indicates, 9% of the men died in the UK. Some were lost because their ships were torpedoed in English coastal waters, some in air accidents, others died of illness and one committed suicide. 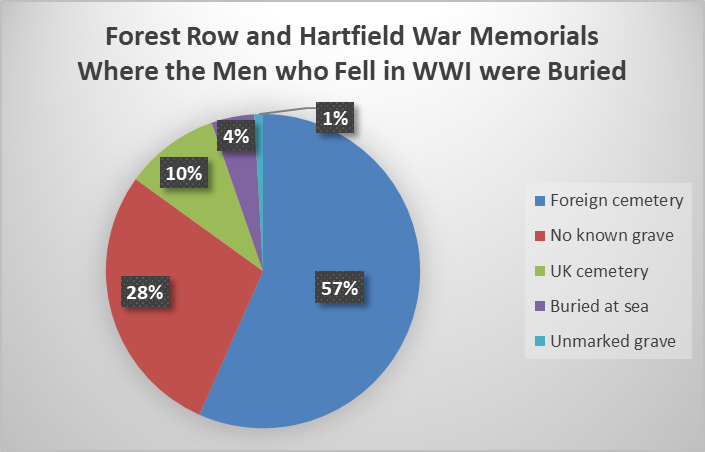 More than a quarter (28%) of the men commemorated on Forest Row and Hartfield war memorials have no known grave. * The Western Front, disproportionately, accounts for 88% of them. For those men with known graves, more than half in the cohort (57%) were buried in foreign cemeteries, and the Western Front accounts for 83% of them. Until 1915 many bodies were brought home but the scale of the casualties meant this was deemed impossible and unsanitary. The Imperial War Graves Commission, founded in 1917, resolved not to repatriate bodies and decided to bury them beneath matching memorials with plain gravestones to avoid distinctions based on class or rank (a policy which stirred some controversy; see for example Shaping Our Sorrow). Five men were lost or buried at sea. Two were serving in the Royal Navy close to the coast of England, three were soldiers lost when their ships sank during the Gallipoli campaign. Closer to home, six men are buried in the cemetery of Holy Trinity Church, Forest Row. Two are buried at Holy Trinity, Coleman's Hatch, and one at St.Mary's, Hartfield. The map above shows the recruiting grounds of the regular army in 1915. Traditionally the men from Forest Row and Hartfield would have enlisted with their county regiment, the Royal Sussex Regiment. In fact, just over a quarter of the cohort — 32 men, 28% of the total — were serving with the Royal Sussex Regiment at the time of their death. 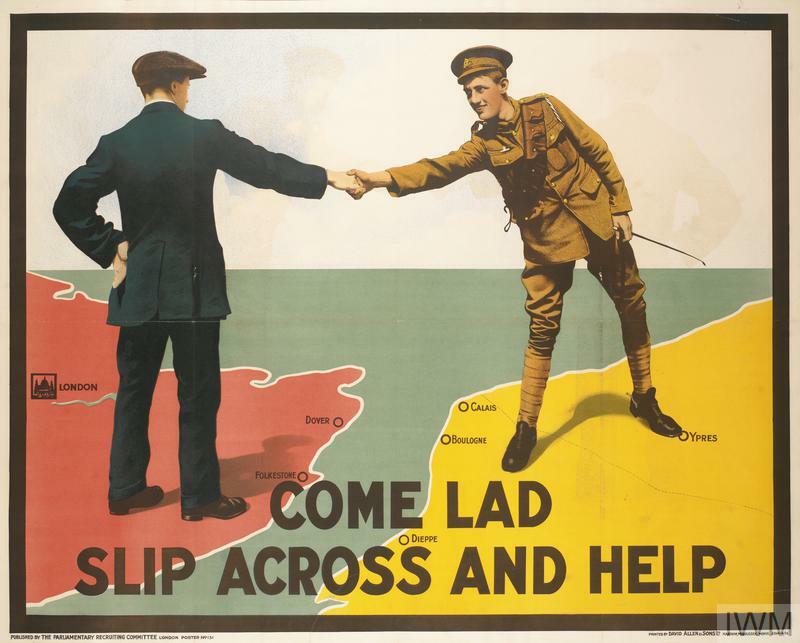 Soon after the war began it was realised (particularly by Lord Kitchener) that there was an urgent need to recruit large numbers of men to serve in the armed forces. A drive ensued to recruit men into Kitchener's New Armies and into existing territorial regiments including the new 'Pals' battalions which successfully recruited groups of men from workplaces, villages, educational institutions, and so on. 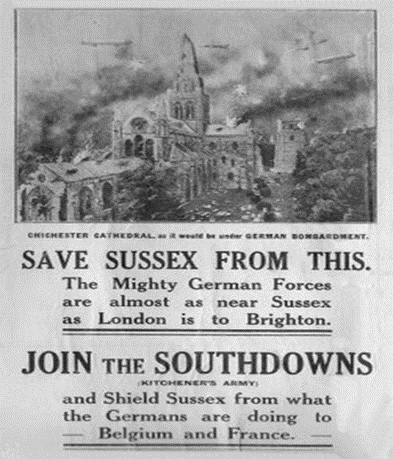 The Royal Sussex Regiment's 11th, 12th and 13th battalions — 'The Southdowns' — were 'pals' battalions raised and equipped with Kitchener's agreement by Claude William Henry Lowther, Unionist MP for North Cumberland, who had acquired Herstmonceux castle in 1910, and they subsequently became known as "Lowther's Lambs". The battalions were formed at Bexhill on 20 November 1914, where some 1,100 men enlisted in 56 hours. Lowther held the temporary rank of Lieutenant-Colonel but he did not lead the men to France himself, and withdrew to Herstmonceux. The three battalions were later to suffer heavy casualties at Ferme du Bois near Richebourg l'Avoué on 30 June 1916 in a diversionary attack twenty-four hours before the Somme offensive was launched. The disaster, in which 366 men died and over 1,000 were wounded or taken prisoner, became known as "The Day Sussex Died". Four of the men commemorated on the Forest Row and Hartfield war memorials were serving with the Southdown battalions, but none of them fell on that day. As the above pie chart shows, the majority of the men served in regiments other than the Royal Sussex Regiment. Just over a quarter (28%) of the men were serving with the latter at the time of their death. This may seem a surprisingly low proportion, especially given the efforts to recruit volunteers into the regiment in the early years of the war. 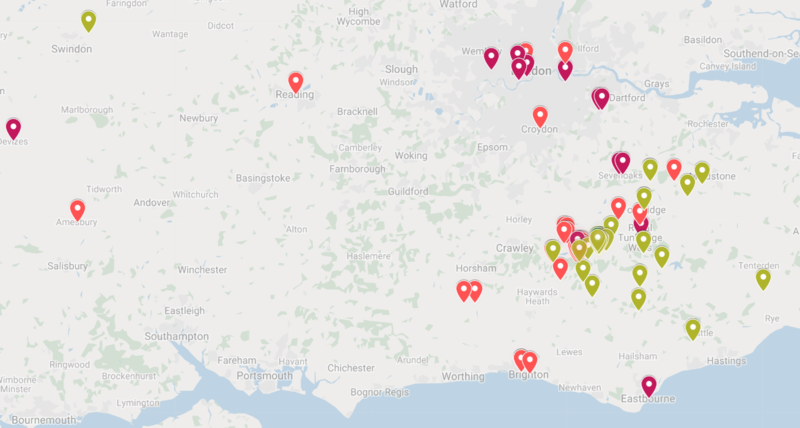 Partly this is to do with where Forest Row and Hartfield parishes are situated. They lie on the north side of Ashdown Forest close to the border with Kent and Surrey and not far from London. Some men had strong personal, family and work-related ties especially to Kent and London, so it is not surprising that they would enlist with such regiments as the Royal West Kent Regiment, the East Kent Regiment ("The Buffs") and the Royal Fusiliers (London) — the most 'popular' regiment after the Royal Sussex Regiment. 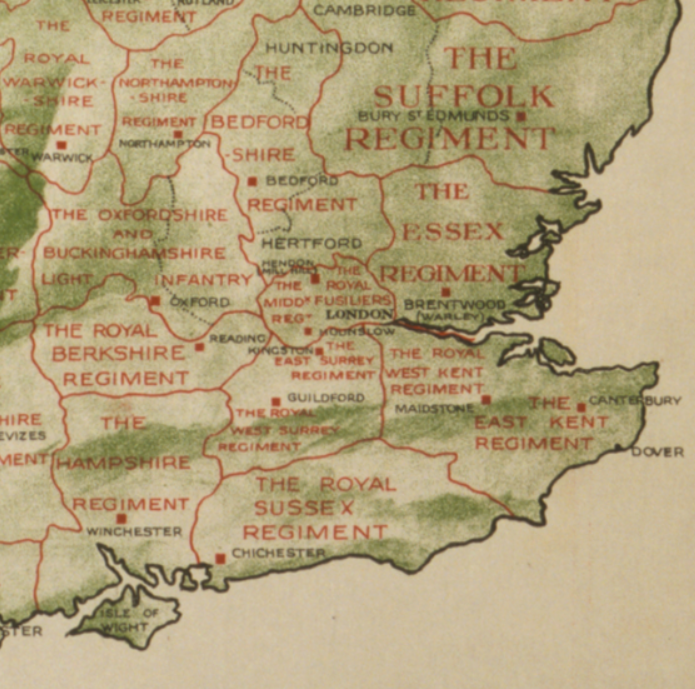 Looking at the south-east as a whole, almost half (47%) the men were serving with regiments based in Sussex, Kent, Surrey, and London. But many of the men who are commemorated at Forest Row and Hartfield had enlisted with a whole variety of other regiments across the country while others who had initially enlisted with the Royal Sussex Regiment transferred later to other regiments and corps, in some cases to units that hadn't existed at the start of the war, such as the Tank Corps. In fact, the 113 men had been serving in 36 different regiments and corps at the time of their deaths, including many that were not territorially based, such as the Royal Engineers, the Machine Gun Corps, the Royal Flying Corps, the Royal Field Artillery and the Royal Army Service Corps, while three of the men who died were career seamen with the Royal Navy. Private Ernest Cannon, a head-teacher of a school in Forest Row, joined one of the more unusual regiments, the Artists Rifles. This had been formed in 1859 in Chelsea and was popular with well-educated, cultural men. His profession exempted him from the conscription of 1916 but he later volunteered, enlisting with the Artists Rifles in October 1918. He soon succumbed to influenza, and died aged 28 at a military hospital in Essex just a week before the Armistice. Interestingly, he was the only one of the 113 men to die from influenza, despite the devastating epidemic of 1918-19. 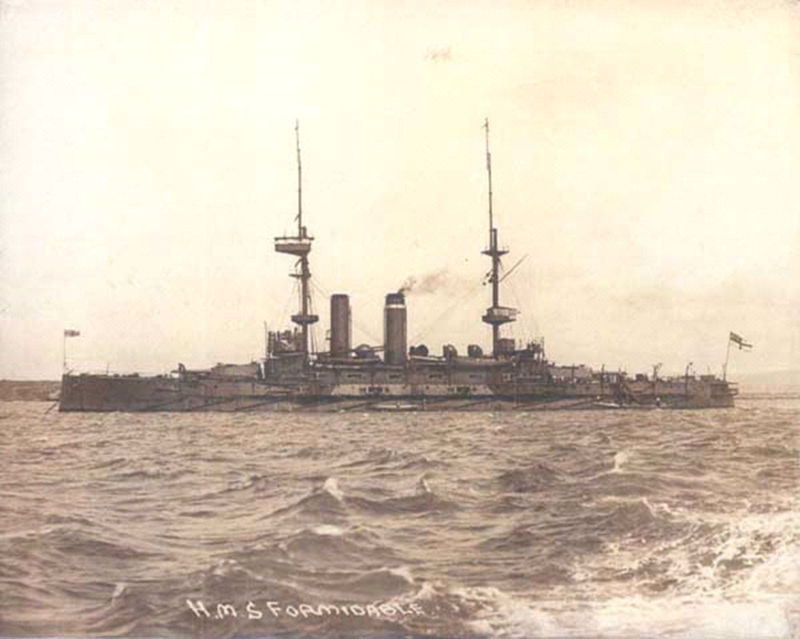 Two Ashdown men serving in the Royal Navy died when their ships were torpedoed and sunk by German submarines off the coast of southern England in 1915. Henry Biddlecombe, a ship's cook and officer's steward in the Royal Navy who died on New Year's Day 1915 when his ship, HMS Formidable, was torpedoed by a German submarine off Start Point, Devon, with the loss of 500 men. Arthur Upton, a stoker, born near Tunbridge Wells but with parents who came from Forest Row, perished when his ship, HMS Recruit, was torpedoed close to the Thames estuary in May 1915. He was one of the 39 men who were lost out of a crew of 65. But ordinary soldiers were lost at sea too. Two of our men — Sapper Jack Shelley, son of Hartfield's police sergeant, and Driver Ernest Vaughan, a farm labourer from Hartfield — died in the same disaster during the Gallipoli campaign, when the packed troop ship HMS Hythe was rammed by another troop ship, HMS Sarnia. The two ships had been shuttling back and forth with troops between Gallipoli and the Allied base at Mudros, on the Aegean island of Lemnos. The large and fast Sarnia, travelling at full speed, cut the Hythe halfway through. The Hythe sank in just ten minutes. 154 soldiers and crew were lost, many trapped inside or drowned in the ensuing chaos. Both men are commemorated at the great Helles memorial that overlooks the entrance to the Dardanelles. 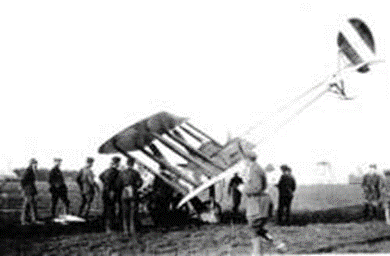 The war in the air developed rapidly between 1914 and 1918. The Royal Flying Corps, formed in 1912, and the Royal Naval Air Service, founded on 1 July 1914, expanded steadily and merged on 1 April 1918 to form the RAF. But early aircraft were primitive and unreliable and navigation poor. Inevitably, there were casualties among our men — five in total. Two died in air accidents: Captain Dr. Keith Lucas FRS, aged 37, a distinguished scientist who made vital improvements to airborne navigational compasses, was killed in a collision flying over Salisbury Plain carrying out developmental work, while Captain Nigel Whitfield, aged 27, died in hospital in London after an unspecified flying accident. Aerial observation and photography over enemy lines was a vital early role of the airmen, and three of our men were killed in action performing this important role: Lt. Frederick Polehampton, aged 41, was killed near Ypres in 1915 just a day after his squadron, which carried out strategic reconnaissance and special missions, arrived in France. Lt. Cyril Robinson, aged 22, was killed over the Somme in 1918. Lt. Eric Waters, an electrical engineer, died in 1917, aged 30, while on a photographic patrol over Flanders: his plane was shot up, and his passenger, the observer, climbed into his pilot's cockpit and succeeded in landing it near Ypres. He survived, but Eric, shot in the back and head, did not. Families from all backgrounds and from all levels of society, including those with more tenuous or distant links to the Forest, lost men in the war. There are ten cases where two or more brothers fell in the war, involving 21 men — 19% of the cohort. Beyond that, looking at the extended families and taking into account relations such as brothers-in-law and cousins, the ramifications of war-time losses could go much further. With respect to local families occupying the more elite levels of society, perhaps the most striking example of multiple losses is the three Kekewich brothers, John, George and Hanbury, pictured above. They were the sons of Lewis Pendarves Kekewich, a London metal trader who had acquired the grand estate of Kidbrooke Park at Forest Row before the War. They were all old Etonians who served as commissioned officers, and all three rose during the war to the rank of Captain. They served and fell in two contrasting theatres of war, George and Hanbury in Palestine and John at Loos on the Western Front. It is tempting to suggest that the brothers might not have had very strong personal links to Forest Row and to Ashdown Forest, but it is noteworthy that one of the brothers, George Kekewich, became well-known in Forest Row as the village scoutmaster before the war. For completeness, it should be noted that they had a fourth brother who served in the War and survived, later working in the War Office. 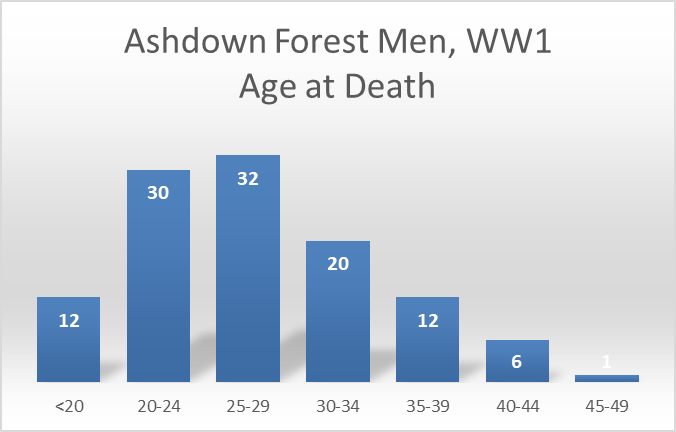 The close-knit nature of the Ashdown Forest communities meant that some families were hard hit by the losses of the war. Two families that lived in relatively humble circumstances illustrate this point. 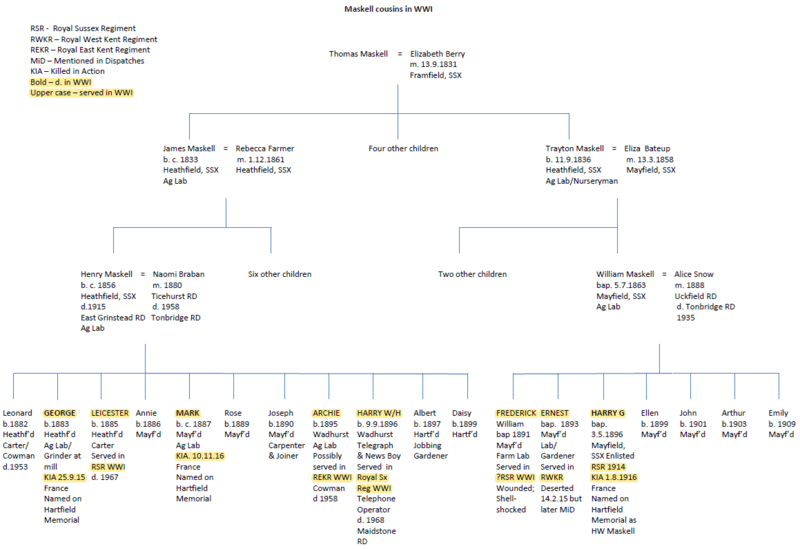 Two branches of the east Sussex-based Maskell family who shared a common ancestor, Thomas Maskell, lived close to each other in Hartfield just before the beginning of the war. The family tree above shows these branches, with highlighting to indicate the men who died in the War. One of Thomas' grandsons, Henry Maskell, had thirteen children including eight sons, born between 1882 and 1899, five of whom served in the war. Two, George and Mark, were killed, and three survived. Another grandson, William Maskell, had five sons, two of whom would have been too young to serve in the war. The three remaining sons did serve and of those one, Harry George Maskell, died, while another was left shell-shocked and a third deserted but was later mentioned in despatches. 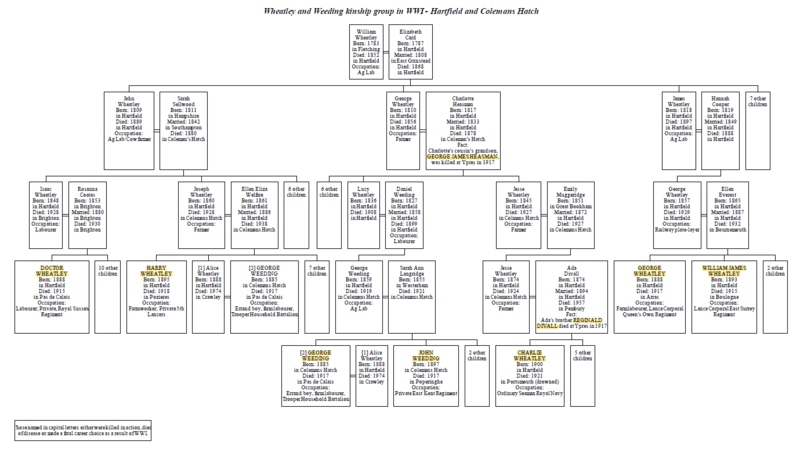 The family tree of the second family, the Weeding and Wheatley family, shown above, centred on Hartfield and Coleman's Hatch, is rather more dispersed. It shows the descendants of the William Wheatley and Elizabeth Card, who married in East Grinstead in 1808. The men who died in the War are again highlighted. It illustrates the number of deaths which this extended family suffered during the War. Six men died who were related by common ancestry. They were cousins Private Doctor Wheatley and Private Harry Wheatley, brothers-in-law Trooper George Weeding and Private John Weeding, and two brothers, Lance Corporals George Wheatley and William James Wheatley. Another two men on the family tree were rather more distantly related through marriages, namely Privates Reginald Divall and George James Heasman. The ninth and youngest casualty of this extended family, Ordinary Seaman Charlie Wheatley, died after the war in a drowning incident at Portsmouth. All nine men died on the Western Front. And, to echo a point made elsewhere in this essay, while all were born in Hartfield, only two of them were serving with the county regiment, the Royal Sussex, when they died. Six were serving with a variety of other regiments (East Surrey, East Kent, Royal West Kent, Royal Fusiliers, Lancers, Household Battalion) and one with the Royal Navy. The war had a devastating impact on some families living in the parish of Forest Row, but what was the overall impact on the community? 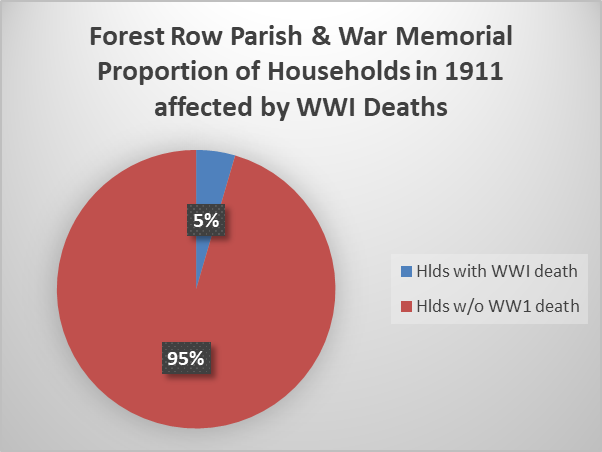 One way of answering this question might be to look at the 1911 census of population of Forest Row and to try to link this to the men who fell in WWI and are commemorated on Forest Row war memorial. 32 men listed in the 1911 census for Forest Row are commemorated on the war memorial as First World War casualties. This compares with a total parish population of 3,030. They are found in 29 households. A further two men named on the memorial were not enumerated in the census for Forest Row but were family members of two households who were enumerated. The combined 31 households represent just one-twentieth (5%) of the 708 households identified in the census — see chart above. The impact of the war on the local community however should not only be assessed in terms of the deaths of the men commemorated on the war memorials in Forest Row and Hartfield but also of the impact of the physical and mental injuries sustained by other men from these parishes who served in the First World War but survived, injuries which they might have suffered from for the rest of their lives. War Office statistics for the First World War indicate that of all those who served in the British Army, 26% were wounded. Of those, 64% returned to full service, 18% returned to service but on restricted duties, 8% were invalided out of service, and 7% died. The impact on the local communities of the deaths of so many local men and of the return from the war into civilian life of possibly even more local men suffering from chronic physical and mental injuries is another aspect of the War that will have to be left for future research to address. 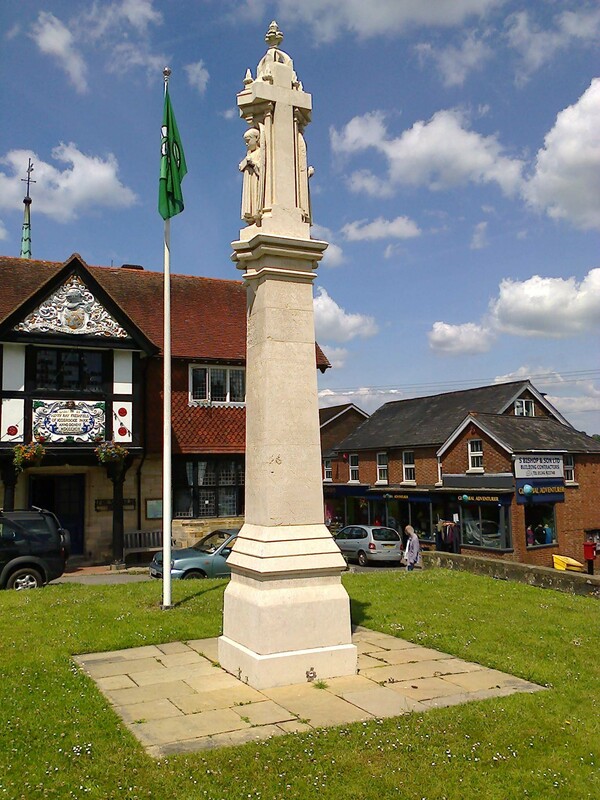 The Ashdown Forest Research Group's project to research the men commemorated on Forest Row, Hartfield and Coleman's Hatch war memorials who fell in the First World War began in 2013. All 113 studies were completed in time for the centenary of the Armistice on 11 November 2018. The project, however, is not yet finished. The Group's research relied heavily on sources of information available over the Internet and during the five years the project has been under way a large amount of additional information has become available, prompted by the War's centenary. A task that remains for the Group therefore is to revisit the case studies it has written, particularly those completed early on in the project, to see whether they need to be revised or added to in the light of this new information. This will be a job to be undertaken in 2019. Click on the image above to view and explore an interactive Google map which shows the birthplaces of the men on the two war memorials. The red markers refer to men commemorated on the Forest Row war memorial (maroon to officers), the green to those commemorated on Hartfield war memorial (dark green to officers). If a marker on the map is clicked a box will be displayed indicating the man's name, the war memorial on which he is commemorated, his place of birth, with a hyperlink to the Group's case study. Clicking on the top left of the map reveals a list of all the men on Forest Row and Hartfield war memorials. Click on the image to view and explore an interactive Google map which shows the cemeteries where the men on the two war memorials are buried (blue markers) or, if there is no known grave, the memorials where they are commemorated (red markers). 1 (a). Summary list of the men commemorated on Forest Row and Hartfield war memorials in SURNAME order. (Click on image to view). 1 (b). Summary list of the men commemorated on Forest Row and Hartfield war memorials in order of DATE OF DEATH. (Click on image to view). 2. Summary table listing the cemeteries and memorials where the men are buried or commemorated. (Click on image to view). The case studies may be read online or as two PDF compilations. (Note: the online case studies are usually the most up-to-date). Click HERE for a page listing key sources. (3) Grieves, Keith 'Sussex in the First World War', chapter 58 in Leslie, K. and Short, B. (1999) An Historical Atlas of Sussex. Chichester: Phillimore & Co Ltd.
(5) Tiller, K. Remembrance and Community: War Memorials and Local History. British Association for Local History (2013). Ashbourne, Derbyshire. (6) Smith, Victor 'Kent and the First World War', chapter 66 in Lawson, Terence and Killingray, David, (2004) An Historical Atlas of Kent. Chichester: Phillimore & Co Ltd.
(7) Statistics of the War Effort of the British Empire during the Great War, 1914-1920. The War Office (1922) London: HMSO.